the root of all evil for Portugal. Up until 5pm on June 16, 2014, everything seemed to be tip-top in Portugal. The sun was (finally) shining, summer was in bloom and the TV, press and Internet were littered with motivational jingles and clichés. The national team was just about to kick-off their World Cup in the fraternal soil of their "país irmão" and the side boasted Cristiano Ronaldo, the world's best player and figurehead of recent Champions League victors Real Madrid. By 7pm, everything was a mess. The football team that used to unite all Portuguese people (or some thought or wished) had become a joke, its players a cluster of pampered professionals who did not deserve the money they got nor the pride their fellow country men had invested in them. In short: same ol', same ol' back in Portugal. Love and embrace 'em when they win, crush 'em when they lose. Rather than discussing the result and what it all means - or may mean - at length, we will be looking at the process, namely where some of the problems lay and how/if they can be sorted out in time. The formation of any given team is of little importance in the grand scheme of all things football. As the saying goes, tactics stand for nothing on paper - meaning that it's rather the dynamics that are implemented within said tactical framework that are relevant, not the theoretical representations of a 4x3x3 or 3x5x2. In the case of the Portuguese national team, there seems to be little to no collective thinking, not in terms of group cohesion, but rather in terms of what to do in the game's different phases. The centre-backs seem to have the ball or their direct opponent as their sole responsibility, regardless of where it ends up taking them. The midfielders do not provide the necessary coverage for each other, let alone for their defence. The poor attackers are left to their own devices, with a game plan that essentially boils down to "get the ball to Ronaldo now!" Therefore, it results utterly pointless to dissect the formation, since none will work if there is no tactical blueprint and if the players' features do not fit into it (when in doubt, please see Spain's case during the current World Cup). Whether in 4x4x2, 4x3x3 or 4x2x3x1, without an underlying collective understanding of the game, few teams will prosper. Cristiano Ronaldo is by far the team's most gifted player. He is the captain, the man everyone turns to for guidance. That much was clearly on display when Nani (for instance), presented with a clear-cut opportunity, kept looking over his shoulder to give the ball to Ronaldo. However, it's become painfully clear that Ronaldo's numerous shots, sprints and goals come at a defensive cost. 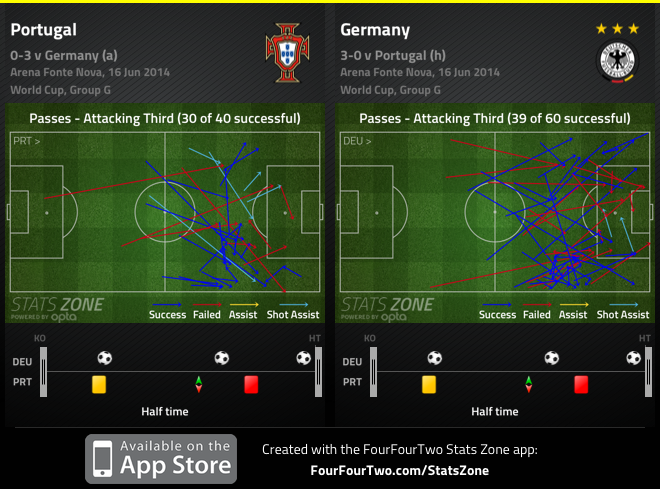 of defensive input down Portugal's left paint an explanatory picture. It is no surprise then that Real Madrid managed to grab their Décima by pairing him with Benzema up front, thus efficiently covering both wings. Most opponents had identified Portugal and Real Madrid's left wing as their main gateway. If Portugal coach Paulo Bento is to insist on this formation based on the same principles, the left wing - now without Fábio Coentrão, no less - will be a primary target for upcoming opponents. 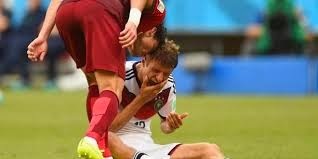 On the attacking front, Ronaldo actually suffered from being offered little service down his side, despite the scare Portugal gave Germany in the match's initial period, where Hugo Almeida ended up squandering a good opportunity presented by his captain. Despite his limited playing time at Manchester United, Nani was often called upon to carry the ball forward. In fact, it was Manchester United's once super-sub Nani that saw the ball more often, while also contributing a little more defensively. All this seems to confirm that Ronaldo might just be better off stationed up front - playing off a proper, designated no. 9 such as Éder - than parading all his abilities down the left. 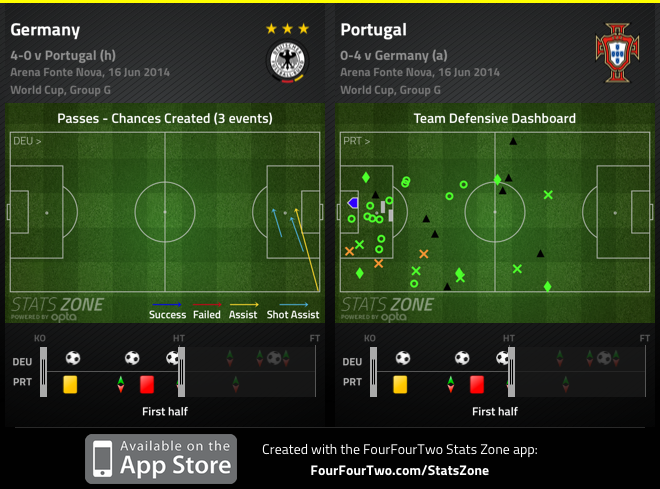 Portugal ended up favouring their right side both offensively and defensively. When Miguel Veloso first burst onto the scene of Portuguese football, it was a breath of fresh air. It seemed Portugal would have a gifted ball-playing holding midfielder for years to come. Unfortunately for him, it did not pan out that way and Veloso now finds himself plying his trade for Dynamo Kiev after being considered for greater heights. He has become slow and apparently lost even the ability to put himself in the right spots according to his position, often jeopardising the team's defensive solidity. Miguel Veloso contributed precious little defensively against Germany. If William Carvalho is to replace him against the United States (a possibility formulated elsewhere), the defensive dashboard of Portugal's defensive midfielder might be a tad busier than the above one. During his early years, Hugo Almeida was thought to be the answer to many Portuguese supporters: A tall, strong, robust, left-footed striker. The long-standing issue of "good football but the balls never goes in the net" that harassed the Portuguese national team (and clubs to a lesser extent) seemed to be all but over. However, like Veloso, Almeida's evolution stagnated. A good four-year spell at Werder Bremen earned him a move to Turkish side Besiktas, all of which did not grant him an extension of his somewhat limited bag of tricks. Despite his physical presence, Almeida does not offer the link-up play the maligned Hélder Postiga provides and he's not exactly the most mobile of players. Éder replaced the injured Hugo Almeida and immediately improved Portugal's incisiveness. When Almeida was forced to limp off the pitch, on came Braga's Éder, a forward who, despite his long-term injury, seems to combine most features of his two fellow strikers: On one hand, he is able to hold the ball up and allow his team to progress up the pitch. On the other hand, he's fast enough to create problems, as Germany's Mats Hummels can attest. All in all, there seems to be a glaring beckoning for greater collective organsiation within the Portuguese team. In a tournament where most teams have fared apparently under no detailed instructions from their managers and relied hugely on their top performers, the only way to improve the side's odds is to offer them a map they can follow, rather than leaving them to their own devices. In a competition that has been so dominated by individual displays, Portugal must make use of a clear plan if they are to stop the progressively decaying talent pool from drying out altogether. You address some of the main issues and I´d like to comment on them. I think our main problem is the "same-old-same-old-under performing Portugal", without collective cohesiveness, game-plan, etc, when it comes to the real test. This is painful to watch because we never lacked quality and then are forced to see worse teams doing much better than us. To me, all this is coach. And, in short, I think we have great coaches back home but not great coaches for cup tournaments. For some reason, this is particularly true when it comes to the Selecção. Except Mourinho. Perhaps J Jesus in the future. There have been exceptions: Euro 2000, the Scolari period and Euro 2012. I believe that in 2000 it was all due to the players attitude and very little because of the coach. I think that in the Scolari period it was the coach. And in 2012 it was P Bento and CR. But I leave to you the discussion of why this seems to be the case. Veloso is OK but his form went down, as you say, and I think he requires the midfield to be the 3M. That is, a midfield with three #8s. But POR always needs a real #6. Éder showed he is very limited. On the other hand, I wonder... How many times did he play with Nani and CR simultaneously? And then he´s thrown in the arena, because Almeida and Postiga were injured. Unlike what seems to be the dominating opinion in Portugal, I don´t think Nani played particularly well in the WC2014. I think CR should be able to play as #9 on occasion. But not to start as #9. As a striker his best qualities will not show. He´s an excellent finisher but he´s not a good striker. In fact, he is an excellent finisher when there is a striker, or two, around. And his strength is on the wing and cutting inside. On the other hand, sometimes it´s obvious that this could have been done in some situations. The USA game was good to show this. P Bento tried: 1) a 4-3-3 with a fake #9 (Rafa/Cameroon); 2) a 4-3-3 with a fake #8 (Coentrão/Greece, if I´m not mistaken) and 3) a 4-3-3 with a fake #10 (Nani/several times in the past). The first option becomes a 4-4-2 diamond. I really liked to see Rafa playing. But it was clear this needed working. The ball didn´t reach the wingers. The second option is good and Ancelotti is doing it in Real with Di Maria. But while the first option kept midfield overcrowded, without much ball progression and without width, the second option left our midfield too exposed. Arguably not a big problem when against Greece. The third option didn´t really bring much in the past. Of course, we can´t really conclude anything because we´re playing with 2 #8s (Moutinho and Meireles). This could only be conclusive when comparing Nani as #10 and a real #10. What he never tried was perhaps the most obvious answer: the normal 4-3-3 with Rafa #10, Moutinho $8 and Carvalho #6. A different approach would be to test a 4-4-2 diamond using a winger like Nani as interior. In attack he moves wide. Like Ramires did so often. A final experiment could be the same 4-4-2 diamond I described above, but with CR and a #9 or an attacking winger that also cuts in, like Quaresma. I don´t think a pure 4-4-2 diamond with CR and a classic winger up front will do it. But the fake 4-4-2 diamond, either with Nani or Coentrão in the middle and/or CR plus Quaresma, or a striker, up front might make sense. I think these options could furthermore compensate the fact CR is gradually playing less as a pure winger.